(WBIR) Despite it not being on the agenda Thursday night, parents packed the Monroe County School Board meeting in hopes of talking about the punishment students received for a destructive school prank. Director of Schools Tim Blankenship spoke publicly for the first time about the vandalism last week at Sequoyah High School. Blankenship made a short statement after other school board members talked about the prank. He then refused to comment any further. At that point, many parents got up and left. 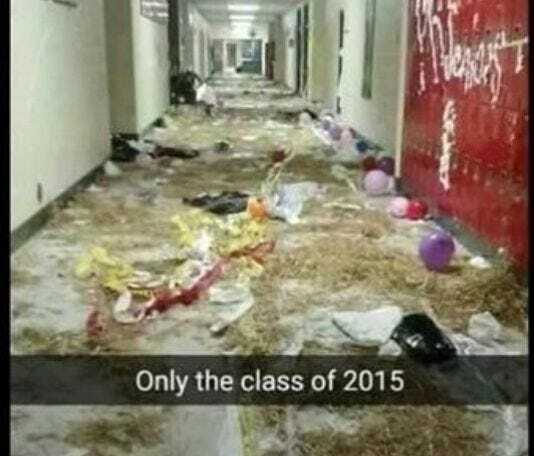 Students who participated in the prank will not be allowed to attend graduation. Some board members and parents disagree about the severity of that punishment. "I've listened to various...our superintendent, I've questioned people, our other SRO officers, but the bottom line is there has to be consequences for behavior like this," school board member Bob Lovingood said. But some parents, like Deborah Brickner, said their kids weren't involved when the prank turned destructive. "He came to what he considered a school function, an event that's been going on for years, when he saw things were getting out of hand he turned around and left and went home. When I asked him why he did not stop it, he responded 'mom there was an SRO there what was I supposed to do?,' she said. TBI is investigating that prank. In response to the vandalism, the Monroe County Sheriff fired a school resource officer and the Director of Schools suspended Sequoyah High's principal.